This entry was posted on September 15, 2011, 5:02 pm and is filed under Mortar. You can follow any responses to this entry through RSS 2.0. You can leave a response, or trackback from your own site. I push the putty through a 1/4 inch sieve on to the sand. Then work it up by hoe. After reading about using lime sand mortar I mixed some by hoe in a plastic tub. I think I mixed it well, using lime putty made from type S masonry lime aged for 40 days and masonry sand. I think I used a bit more lime than minimum then used some for pointing, more for laying a few soft bricks and a soft brick to hard brick interface. The bricks were thoroughly damp and the finished work wraped with 2-3 layers course weave burlap which was kept damp for 6-7 days. After removing the burlap, the bricks are damp and the mortar is so soft that a fingernail is easily pressed into it. No evidence of carbonation. Since the pointing was done a day before laying additional brick, some mortar was left exposed to the air in a thin layer in the plastic mixing box. 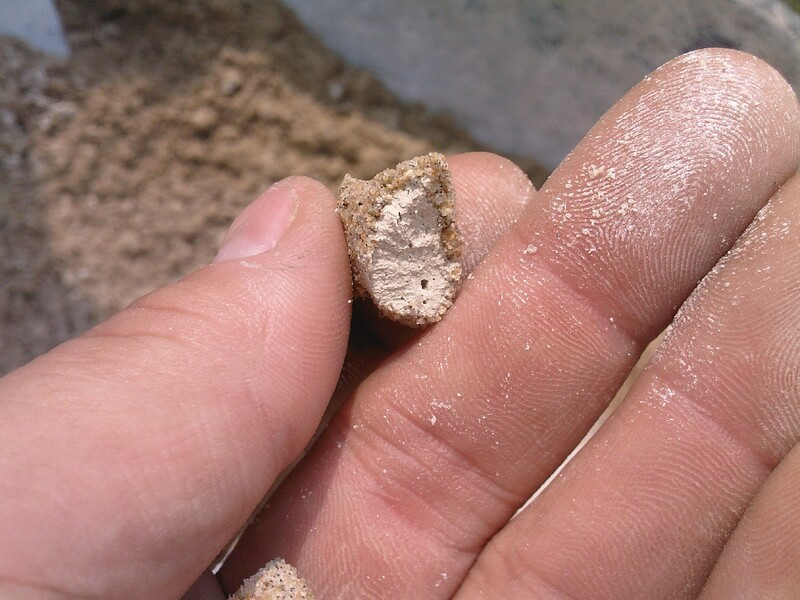 After one day, this dried mortar was too hard to remove with a stiff brush and water so carbonation did occur. What is the correct way to cure the brick? Should I let what I have dry with no effort to keep it damp? Should I restart with slightly hydraulic lime? I have a test sample of 2 bricks made at the same time as the above to experiment with.